Ever since I entered college, my palate has gradually expanded. For example, a cuisine that I never really cared for before coming to La Jolla was Mexican food. I especially did not understand the hype over burrito bowls. Over time, however, the burrito-and-taco-goodness that permeates San Diego won me over, and I can now happily say that Mexican food is one of my favorite cuisines. Because going out to eat all the time is impractical and costly, I often choose to recreate my favorite dishes (even if it would be easier and faster to microwave instant ramen). Recently, my sister introduced me to Twisted via Instagram. Twisted is a social media community dedicated to creating unique recipes by remixing existing ones. Some of its tempting concoctions include lasagna fries, “potato tornadoes,” and cheesecake brownie sandwiches. Many of the recipes seemed tasty and simple enough to replicate. What caught my eye, however, were the chicken fajita taco bowls. True to their name, these scrumptious snacks are made by stuffing shredded chicken, onions, bell peppers, tomatoes, guacamole, Mexican seasoning, cheese, and sour cream into homemade taco bowls. Aside from the sour cream and Mexican seasoning, I had the necessary ingredients on-hand. This dish also seemed to demand very little effort other than preparing the meat and baking the tortillas. I decided to test this recipe out during the week to see how practical and yummy it was. Last Tuesday, I returned home late after a rather long day on campus, so exhausted and ravenous that I nearly gave up on making the fajita taco bowls in favor of microwaving a frozen beef burrito. I also considered trekking to the nearest Chipotle Mexican Grill. In the end, I decided to spare myself another mediocre frozen meal and save money. Fortunately, I had picked up some premade barbacoa from Ralphs a few days ago in lieu of the shredded chicken. This may be considered cheating, but — as I have stated in my first volume — I am lazy and impatient. Per the package’s instructions, I boiled the bag of barbacoa for eight minutes while preparing the other ingredients. First, I tucked two medium-sized white flour tortillas brushed with a light drizzle of olive oil (since I didn’t have butter like the recipe asked for) in between the grooves on a cupcake tray and baked them for just another eight minutes. As expected, they turned out nicely crispy. While the tortillas were in the oven, I diced my vegetables and briefly sauteed them. Instead of sour cream, I opted for some Southwest-style salsa. Once the barbacoa had finished cooking, I assembled everything into the tortilla cups and sprinkled shredded sharp cheddar on top. After a little over 20 minutes, the moment of truth had arrived. I eagerly dug into my dinner, too famished to even remember to photograph the finished product for this article. However, I am pleased to write that the fajita taco bowls were a success. Granted, while some lime and seasoning would have further elevated the flavors, the meal was still delicious. It is difficult to go wrong with simple ingredients that are likely already in your kitchen. I recommend this easy and flexible recipe for anyone who fancies a slightly more elaborate meal without any of the stress. Because everything can be prepared simultaneously, you won’t spend too much time in the kitchen — perfect for any commuter or university student. ½ cup of Del Real Foods Slow Cooked Beef Barbacoa or any product of your choice. Lightly brush olive oil onto the tortillas. Fold them in between the underside of a cupcake tray, creating a square taco bowl shape. You can also place custard cups on a shallow baking pan if you don’t have a cupcake tray. Bake the tortillas at 350 F for eight minutes. While the tortillas are in the oven, prepare the barbacoa according to the product’s cooking instructions. Wash and dice the vegetables. Heat up a skillet or frying pan to medium heat, add a drizzle of oil or a pat of butter, and saute your vegetables for just a few minutes. Mash an avocado in a bowl and sprinkle salt and pepper to your liking. You can also drizzle some lemon or lime juice. When the tortillas have finished baking, remove them from the oven. Allow them to cool for a minute or two. 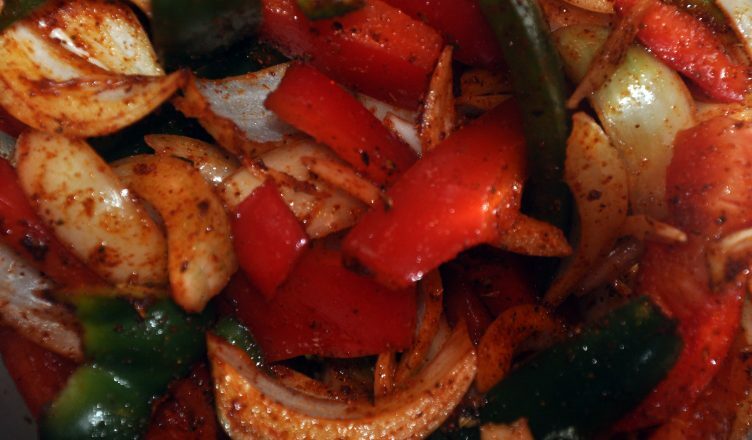 Scoop the barbacoa and vegetables into the tortilla bowls. Top off with as much jalapenos, guacamole, and cheese as desired.